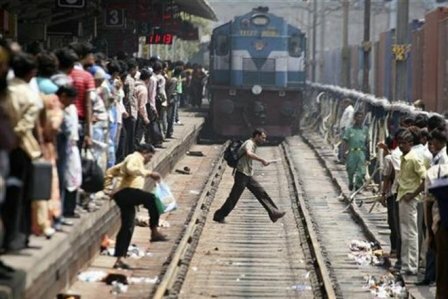 Lucknow: Six youth were run over by a train engine early on Monday in Hapur district of Uttar Pradesh, police said. The incident occurred in Pilakhua when seven of them were loitering around a railway track. They apparently had ear phones on and were listening to music when the tragedy struck. All were daily wagers and worked as painters. The victims were supposed to board a train from Ghaziabad for a painting contract in Hyderabad. But they missed that train and returned to Pilakhua a little after midnight. According to eyewitnesses, they appeared disturbed and were walking dangerously close to the railway tracks near the Gandhi Gate. Salim, Arif, Sameer, Akash, Rahul and Vijay -- were run over by the train engine on a 'shuttling' duty. One person, critically injured, was admitted to a medical facility. An angry mob started protesting at the accident site. However, senior officials, including District Magistrate Krishna Karunesh and Superintendent of Police Hemant Kutiyal, who reached the spot, pacified them and the bodies were sent for post-mortem, an official said.